On Christmas Eve, 1958, thousands of people poured through Hamamatsucho Station in Tokyo’s Minato Ward to take in Japan’s first postwar shot at a “public attraction.” There was nothing particularly cute about it; no fearsome rides, or cuddly characters to have your photo taken with. What’s more, visitors still had to walk another kilometer to get to it. Yet, for a nation still mentally and physically flattened by war, the construction of Tokyo Tower was a giant symbolic step toward revival. When the 90-meter antenna was bolted into place on Oct. 14, 1958, the completed tower stood 333 meters high, making it the world’s tallest freestanding structure — overtaking the Eiffel Tower in Paris by 13 meters. More than 40 years later, the television- and radio-relay tower can still bask in its “world’s highest” status — albeit with the necessary addition of the word “steel” to maintain its primacy. For decades now Tokyo Tower, painted in striking orange and white to meet aviation safety regulations, has been the symbol of the capital. It’s also a major crowd-puller. Since the tower opened, its elevators have shuttled more than 130 million people up to its two observation platforms at 150 and 250 meters. One of these visitors was 7-year-old Hatsuna Niwa from Aichi Prefecture, on a weekend trip with her parents to visit the tower and Tokyo Disney Sea this month. Of the two, she said she preferred the former. Why? “Because it’s big,” she explained. “It’s not the prettiest of landmarks,” said James Moy, a visitor from Singapore who had, nonetheless, just walked 4 km from JR Tokyo Station to see it. Of course, the tower’s primary function was not an aesthetic one: Five FM radio stations and nine TV stations transmit from the tower today. It also houses quake-detecting and traffic monitoring devices and, reportedly, other high-tech security surveillance systems, too. But it did turn heads at the time of its construction. A report in The Japan Times shortly before the tower’s completion says that Isamu Kamei, an expert involved in its design, had received a request from France “to study the possibility of extending” the Paris landmark. However, to one Japanese man, size mattered. Others have said that Maeda originally wanted to make the tower taller than the Empire State Building, which at 381 meters was the highest structure in the world until 1954. However, his grand design was foiled, it seems, by lack of both funds and materials. In the end, the tower’s height was determined by the distance the TV stations needed to transmit throughout the Kanto region, a distance of about 150 km, said NTCC official Keisuke Yokoyama. The need for such a lofty tower began with the establishment of Nippon Hoso Kyokai, Japan’s national broadcasting station, in 1953. NHK had built its own transmission tower, and when other privately run broadcasting companies started operations in the months that followed, the government feared the metropolis would become cluttered with transmission towers. And thus the idea of one large tower capable of transmitting to the entire Kanto region was born. Plans for the structure were drawn up by Tachu Naito, known as the “tower professor,” who designed many other buildings in Japan, notably the Kabukiza in Tokyo’s Ginza district (a notable survivor of the 1923 Great Kanto Earthquake) and Nagoya’s TV tower. With the assistance of architecture and engineering giant Nikken Planning Ltd., Naito’s tower was claimed to be able to withstand earthquakes with twice the intensity of the Great Kanto Earthquake, a 7.9 temblor that flattened Tokyo and its environs in 1923, or the most ferocious typhoon recorded in Japan at the time — 1939’s Muroto Typhoon, which hit with wind speeds of up to 220 kph. Naito’s groundbreaking design, including streamlined girders, meant that the structure was, at 4,000 tons, almost half the weight of the Eiffel Tower. On top of that, every five years it bulks up a bit more as it undergoes a yearlong makeover with 28,000 liters of paint. Equally as impressive as its size, strength and design was the speed with which building materials were gathered and the relatively short time it took to assemble the tower with its countless welds and 270,000 rivets. This was a time of thrift and a shortage of resources, when producing 4,000 tons of steel was no mean feat. This problem was reportedly overcome in an unlikely, if slightly controversial way — by melting down U.S. tanks used in the 1950-53 Korean War. Hundreds of tobi, Japan’s traditional construction workers on high buildings, came to Tokyo from all over the country to work on the new landmark, and each day more than 400 laborers worked on site, said Yokoyama. Construction began in the summer of ’57 and was completed just 15 months later — a remarkable achievement considering that there were none of today’s high-rise cranes, only motorized winches and pulleys to hoist the massive girders. Old photos of the construction process show tobi peering groundward from over 200 meters, with nothing but bamboo scaffolding to support them. Only one tobi lost his life when strong winds swept through the site one year into the project. The project was costly in financial terms, Yokoyama said, totaling 3 billion yen, which today would be the equivalent of about 60 billion yen. 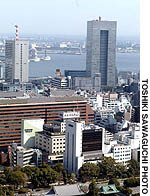 According to a former employee at the tower, who spoke on condition of anonymity, this huge budget raised some eyebrows, not least because Maeda founded NTCC at a time when he was a member of the Upper House — to which he was elected after leaving the major broadsheet newspaper Sankei Shimbun, which he founded in 1933. “Many people are surprised to learn that the tower is privately owned, and even more surprised to learn that it was privately owned by an Upper House member,” the source commented. Rumor had it that Maeda — who died in 1986, and whose family still owns almost half the company’s shares — had also made “significant efforts” to ensure Shiba-koen Station on the Toei Mita Line, which opened in the early 1960s, had an exit leading into the Tokyo Tower complex, the source added. Maeda failed, and today the station is a 15-minute walk away. This distance, however, has never been a serious barrier to visitors. On weekends, thousands come to take in the 360-degree view from the tower’s observation decks, from which the Boso Peninsula and Mount Fuji are visible on a dozen clear days a year, and to enjoy other attractions — an aquarium and wax museum among them — that have been added over the years. Yet, as high-rises such as the 243-meter Metropolitan Government Building in Shinjuku and Yokohama’s 296-meter Landmark Tower have reared up into the region’s skyline, other vantage points — with no admission fees — have given Tokyo Tower a run for its money. At its peak in 1959, 5.2 million people visited the tower. By 1998 this figure was down by half, while by last year it had halved again. NTCC’s annual revenues, which were 5.4 billion yen in 1997, have been falling steadily to an estimated 4.3 billion yen in the fiscal year 2001. A mini-revival occurred in 1989 when the tower installed 164 floodlights to bathe it at night in an attempt to lure young couples. However, other subsequent rejuvenation projects to build a hotel, an art gallery and other facilities on the grounds have been left on the back burner since the economy’s downturn. The declining number of visitors is not the only threat to Tokyo Tower’s future. In 1997, the government announced plans to start land-based digital broadcasting. With Tokyo Tower rapidly falling in the shadow of the capital’s high-rises, which can serve as obstacles to the microwave transmission needed in TV broadcasting, a much higher new tower was seen as essential. Several sites have been earmarked over the past half decade — Saitama City, Shinjuku and, most recently, JR Akihabara Station, to name a few. NTCC has made efforts to deflect the threat of losing its broadcasting company clients — whose rental fees account for half its annual revenues. In 1998, it proposed constructing a second Tokyo Tower, 707 meters high, next to the existing one. This plan has since been scrapped, said Yokoyama. Fortunately for Tokyo Tower, so too have the other proposed tower projects. Many have hit the same snag, namely airline regulations preventing the construction of such lofty structures on, or close to, the flight paths of the Kanto region’s two main airports, Haneda and New Tokyo International Airport at Narita in Chiba Prefecture. The Akihabara project was abandoned last summer, reportedly due to disagreements over who would undertake the project and foot the bill. Until then, TV companies had shown significant interest in the site as it was not on airlines’ flight paths and would not require household antennas to be realigned — which would be the case if a new tower were built in Saitama, for example. According to metropolitan government officials, there are currently no contestants in the race to build the new tower. While this would seem to throw a lifeline to Tokyo Tower, the official added that if terrestrial analog broadcasting ends as planned in 2010, the tower’s broadcasting days would be over. However, its other functions as a quake detector and tourist attraction, for example, mean it’s unlikely to be taken down in the foreseeable future, he added. With their heads in the clouds on their first date there, though, Akira Imaoka and Megumi Ishiyama said it was still a popular spot for young couples. “I don’t really know anything about its history, but somehow it has a romantic image — that’s why I brought her here,” said Imaoka. Was Ishiyama impressed by her partner’s choice? “It’s OK — but I think I would have preferred Disneyland,” she said, laughing.